I have had a crazy week. Much work stress, some time-consuming and expensive dental work, and generally catching up from being gone last week. It was only two days, but apparently I cram a lot of stuff into each day, because it has been hard to get back on track. I have to be organized this week, though, because we don’t have the money to go out to eat on a busy night this week. I am planning ahead better this time! I have included some links below, but I really noticed this week how much I change recipes when I use them. For one thing, you can take it almost as a given that I use less meat and more vegetables than a recipe calls for. I try to cram as many veggies in our days as possible, and the kids sometimes only eat veggies at dinner, so I need to make a lot. It is also a good way to bulk up a meal for less money and calories. Quick and easy after a busy day. I am adding pork to this vegan recipe, and I will probably sub a mixture of gluten free all purpose flour and cornmeal for the whole wheat flour. The girl didn’t cook last week, because the dentist took forever, so we are trying again this week. The dessert is made with frozen bananas, peanut butter and honey–a nice healthy treat. I will be using a bean blend with beans, peas and lentils that I got from Costco for the dal. I love the way my Cooking for the Rushed book provides directions for whole meals, but I am tweaking this just a bit, because we eat a lot of broccoli and I want something slightly different. 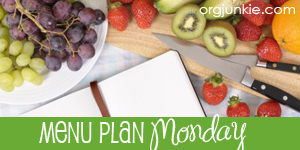 As always, this post will be linked to orgjunkie.com’s Menu Planning Monday–lots more inspiration over there! It is amazing to me how much a simple overnight trip can disrupt our normal schedule. I left Thursday morning and got back on Friday around 10:00 PM, so it basically took two days out of our normal time, but I would have normally been working or sleeping most of that time, anyway. However, the week before the trip was not as productive as normal, too, since I spent a lot of my time preparing for the trip. We spent our whole weekend running errands and getting back on track, so we picked up Qdoba at 7:30 Sunday evening. I am glad to be getting back to normal, now. This week will be busy in its own way. I am still catching up, and we all have dentist appointments Wednesday evening, followed by a 7:00 basketball practice. The girl is going to cook that night while we are at basketball, so we are having one of her favorite meals. Yesterday was my dad’s birthday, so I went over to his house and cooked dinner. He bought the lamb chops, and I brought all of the sides, including nearly the last of the tomatoes from my garden. I am trying to make as much food from the freezer and pantry this week as possible, again–Christmas time plus brake repair on the van equals not much more money for groceries! Friday: My daughter is performing in her school’s musical, so we will need something really fast. I am thinking leftovers. I will need to get a few groceries, but not too much. One thing I want to make sure to do this week is have more fruit smoothies for breakfast–we are skimping on the fruit and veggies, and this is a great way to get those extra nutrients in at the start of the day. We make our smoothies with orange juice, bananas, frozen fruit, vanilla and a bit of kale from the garden. For kids’ lunches, I will need to pick up some lunch meat and bread, and possibly some applesauce cups, but we should have plenty of other snacks for them to take. 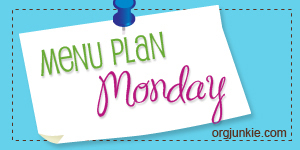 This post will be linked to orgjunkie.com–head over there for lots of great menu ideas! I went shopping on Black Friday with my mom and aunt, then I had to take my car in on Saturday to get the brakes fixed. They were making some grinding noises, but not every time I used the brakes, so I thought I might be getting in there before it became a huge issue, but that turned out not to be the case. $429 later, I am making a menu plan that relies heavily on what is in my pantry/freezer/garden. Yes, garden–there are still kale, broccoli, radishes and a few other greens available out there, plus some tomatoes and tomatilloes we picked two weeks ago when putting the garden to rest for the year. There are Brussels sprouts, too, but they are still growing, and may not be ready this week. Something gnawed at my plants all spring, summer and early fall, but they appear to be growing now. Hooray for cold tolerant veggies! I know, no veggies to speak of. We were tired. I am working from home today, so the turkey has been boiling away all morning, and my house smells like T-day again. I will freeze some, because I am making a huge pot of stock–we had nearly 20 pound bird–and then make the soup with rice and whatever veggies we have in the fridge. We pulled a lot of tomatoes off of the tomato plants two weeks ago before we pulled them for the year; lots of them have turned red, but some are still stubbornly green, so I will fry them up since my mother is coming over. She and I are the only ones who like the fried green tomatoes. The pie is leftover from Saturday night. I do have some red tomatoes to use up, and this soup looks very interesting. I don’t like to go all out cooking when the kids are at their dad’s house, though, so cheese and crackers on the side is enough to round out this meal. I put a lot of veggies in my black beans and rice, so I don’t think I need extras on the side. I may put some Italian sausage in the mix to add some bulk, too. All the crockpot recipe that require you to add things in the middle of the day usually really bother me, because what is convenient about that? Aren’t crockpots supposed to be for days when you are gone all day? However, I work from home on Thursdays, so this will be fine. I have some tomatillos from the garden still that need to be used up, so there may be more than a pound in this…good for the freezer, right? I bought a gluten-free flour mix I will use in this. The kids will be at their dad’s for the weekend, so I am not sure what I will have. Maybe tuna salad, although my mayo is looking pretty old. Maybe leftovers. I should be able to get through the week not buying much more than some egg, juice, bananas and soy milk. I think I will make another turkey and kale frittata tomorrow night for quick breakfasts. We also have cereal, oatmeal and plenty of lunch snacks. What will you be having this week? 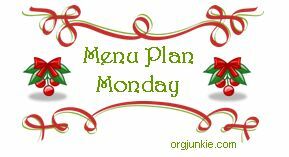 This post will be linked up to Orgjunkie.com for Menu Plan Monday. This is one of those weeks when I would like to avoid the grocery store. I may go buy some bread, orange juice, soy milk and bananas, but then again, I may not. I need more money! Or, less spendthrift ways. I also need to make this quinoa salad on Monday for the teachers’ dinner during parent teacher conferences on Tuesday. I think I will have to make a double batch, because I love that stuff, and that will carry me through the week for lunch. I also need to bring cranberry sauce and pumpkin risotto to work on Thursday, when many of the people on my floor do a potluck holiday feast. So, I will make a double batch of cranberry orange sauce on Monday and a double batch of risotto on Wednesday and I should be set. I will need to buy a few things, but I might be able to get away with only buying red onions, oranges and avocados, plus the items above. Not too shabby for a low-budget week! I usually start my menus on Sunday, and plan for 6 days, but this weekend, I was still feeling a bit sick, so I just did a frozen meal, which there is no need to document here. I did cook from my menu through Wednesday, but on Thursday, I felt so bad that we ordered delivery Chinese for possibly the first time since we lived in this house, maybe ever. We can’t do pizza delivery because of the dairy, and I usually just go get food if we are going to buy restaurant food, but I didn’t want to do anything on Thursday but huddle on the couch under my warm blanket.This week, we are getting back to normal. Real food, cooked regularly. Also, did you know Thanksgiving is only 2 ½ weeks away? I will need to start that planning soon as well. I was going to make the soup last night, but didn’t have the energy. We all love the red beans and rice, so we could have this every week, probably, but that would get boring. I will make extra rice and quinoa for use on Tuesday. The kids will be at their dad’s, so I am making a spicy dinner. I am using a jar of sauce, and adding in sauteed mushrooms, asparagus and onions along with the chicken. I will probably use another kind of nut, but I am excited about this recipe–I love kabocha squash! 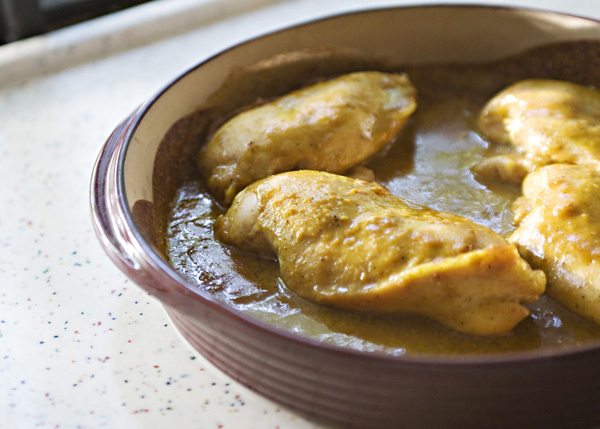 I am super excited about this–I am finally getting some tomatillos from my garden for this! I also have garlic still from this summers harvest, and jalapenos out there, and my gardener is bringing some cilantro from another garden since my fall planting isn’t very big yet. Only the chicken, white beans and onion will not be from my garden. When the kids are here, they always want pizza on Friday nights, ;).